Core strength is critical for running efficiency and performance. This something we have heard repeated over and over in different platforms—from doctors, elite runners, us physical therapists, magazines and websites… and the list goes on. Even with all of this exposure, it is not something that runners tend to give a lot of priority. I think this is because there is a lack of understanding of how exactly the core works in relation to running. Once the “why” is understood, it becomes motivating. First, let’s address the #1 misconception: the core is NOT your six pack! The “six pack”, or rectus abdominus, is a superficial muscle that participates in movement of the body. “The core” refers to smaller, deeper stabilizing muscles. Specifically the transversus abdominus, multifidi and paraspinals, diaphragm, pelvic floor, and oblique muscles. 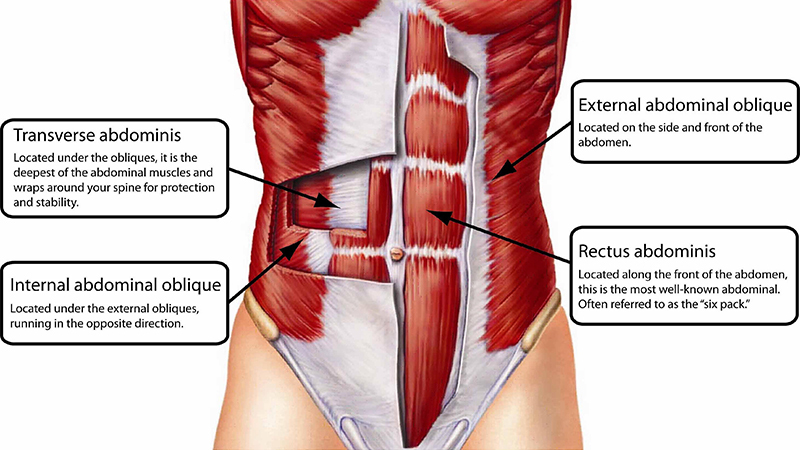 These form a 3D cylindrical shape in the torso; transversus abdominus is the front, multifidi and paraspinals are the back, diaphragm is the top, pelvic floor is the bottom, and obliques are the sides. So when you are told that you need to work on your core, these are the muscles that need to be targeted. And why is this important? What do these little muscles have to do with running? We are always looking to improve performance, and this often includes addressing running inefficiencies and improving running economy. A strong core with good motor control allows power to be transferred through the body with minimal dissipation. If the core is weak a lot of power, or energy, will be lost in the torso. This can be observed in a variety of ways when watching someone run, but a few examples include excessive twisting through the torso and extension maintained in the low back. And when you have to create power/energy instead of transferring it, performance declines. What’s even worse is that running mechanics can be altered in order to compensate for core weakness, increasing the runner’s risk of injury! Now that you understand WHY it is necessary to maintain good core strength, the next step is to learn specific exercises targeting the “core” muscles. Coming soon!